This excellent result, which both sides view as a win–win, was delivered after many years of negotiation and hard work; including an important meeting in Tokyo just last weekend, when my colleague EU Trade Commissioner Cecilia Malmstrom and I held meetings with our Japanese counterparts to make a final push towards an agreement. This important progress meant that EU President Jean-Claude Juncker and Japanese PM Shinzo Abe could smoothly iron out the final details this week. 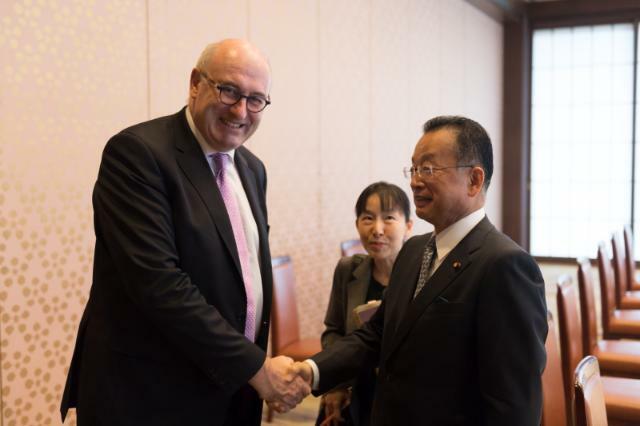 Handshake between Yuji Yamamoto, Japanese Minister for Agriculture, Forestry and Fisheries, on the right, and Phil Hogan. From the agri-food perspective, this agreement means full market access for wine and spirit drinks - a point I made in my speech to the French Viticulture Congress yesterday. 145 million euro's worth of duty will be saved by EU wine exporters each year – this means that European wines are no longer at a competitive disadvantage to wines from Australia or the Americas. The deal also means full market access for key cheeses including Parmiggiano Regiano, gouda and cheddar; and chocolate, biscuits and other high value food products. We have achieved substantially improved market access for beef, pig meat, other dairy products, and processed agricultural products. With the exception of rice, all the agricultural and food products from Europe will benefit from improved access. There is also very substantial progress on removing non-tariff barriers, and we convinced our Japanese partners to grant full protection for the 205 GI names shortlist including feta In fact, all European standards are fully respected. This is an excellent example of trade rules based on our model of agricultural policy which at its core based on the production of quality products. We export high-value goods – hence my continued insistence on rules for GIs in all trade negotiations. In the Japan deal, we were successful in developing a model free trade agreement that fits our export profile, while still delivering a mutually beneficial agreement with our partner. This shows the EU as a global leader and standard-setter in shaping international trade and its rules – a concrete example of the EU "harnessing globalisation". Finally, it must not be forgotten that this deal shows the importance of size in global trade negotiations. A strong, unified European Union, representing 500 million citizens, can deliver benefits for both our exporters and our citizens. No individual Member State could ever hope to achieve what the EU can achieve together.